Get ideas on bathrooms from one of the best custom home builders in NC. Your master bathroom should be a place for relaxation, pampering, and privacy. When designing your custom home, the master bath is a very important room. You need plenty of space and your own unique style. Your bathroom should reflect your personality while also achieving maximum functionality. Often a master bathroom is used by two people, both of whom may need to be in the room at the same time. Plenty of space is helpful, but a strategic layout can help to maximize square footage. 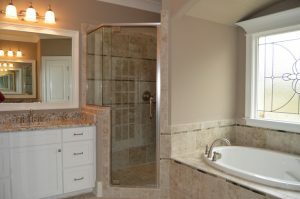 Professional custom home builders in NC have the expertise to design a master bath that is beautiful and easy to use. When two people are in the bathroom getting ready for the day or preparing for bed in the evening, the flow of movement can make all the difference. You need enough clearance between shower stalls, tubs, sinks, and counters to keep from bumping into things and each other. It’s important to consider which way doors open, such as the linen closet, water closet, and shower door. Will it be necessary to walk through the bathroom to get to the master closet? These are important layout considerations for your master bath that custom builders in NC will be able to walk you through. A beautiful master bath will look more beautiful when it is not cluttered with stuff. Only keep the bare minimum of the things you use daily on the counters and put the rest away in the cabinets and drawers you will have built in. You can never have too much storage space in a bathroom. A linen closet inside the bathroom itself offers a place for towels, cleaning supplies, paper products, and any other items you wish to store. The right amount of storage space, when used properly, can significantly improve the everyday look of your bathroom. The style in your master bath should reflect your personal tastes while creating your desired mood. Do you want your bathroom to look and feel like a luxury spa? A large steam shower, stone tile, a jetted soaking tub, and subtle hues will help to achieve this. Are you trying to achieve a Zen type of atmosphere? Include Asian inspired elements such as bamboo and wood tones, artisanal sinks and water elements, and ornate screens over windows or on shower doors. Are you going for an antique or classic bathroom? Incorporate a deep claw foot tub and install antique hardware, faucets, and light fixtures. To achieve the right lighting concept for any bathroom, include dimmable lights and a variety of lighting elements throughout to serve different purposes. When you design your master bath as part of your custom home, the experts at R&K will help you to achieve the look you want with an organic flow that makes sense for everyday use. Explain your vision to these award-winning custom home builders in NC with decades of experience and watch your dream bathroom come to life. Call (336) 643-3503 for a free consultation.